Social isolation is a major problem for seniors in America. Many live alone, or far away from family and friends. Even those who live close to their children, or in a senior’s home, often spend many hours of each day sitting alone. 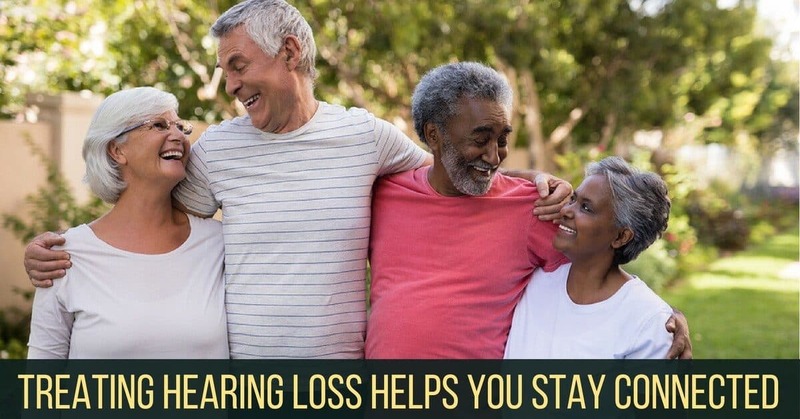 Hearing loss has been linked to higher rates of hearing loss, and reduced quality of life, as seniors struggling to hear have an even harder time connecting to loved ones. One way to fight isolation and stay connected is to treat your hearing loss. For those living with hearing loss, social isolation is often a sad reality. Isolation isn’t just about being alone, it’s the feeling of being disconnected from family and friends, as if you’re in a world of your own. It’s estimated that more than 8 million Americans over the age of 50, or around 20% of seniors, face social isolation, and this number continues to rise. Risk factors for social isolation include retirement from work, a low income, or the death of a spouse. To find out if you’re at risk of social isolation, or experiencing the effects of isolation, visit https://connect2affect.org/assessment/how-connected-are-you/ to take a short quiz. Another risk factor for social isolation is hearing loss. If you’ve been struggling to hear, you know it can be hard to stay connected. You try to keep up with conversations, or follow the story your friend is telling you, but you’re playing an endless guessing game, trying to fill in the blanks in your hearing. It takes so much effort just to hear the words that you often miss the meaning of what’s been said, and have a hard time participating in conversations or catching the punchline of the joke. Eventually, you get so tired of struggling to hear that you choose to stay home rather than face the embarrassment of getting lost in conversations or answering inappropriately. Your relationships within your family suffer as well, and you lose the closest connections in your life. If you’re struggling with social isolation, there are a few steps you can take to get connected. Stay social and look after your current relationships. If you’re struggling to hear when you meet your friends at the restaurant, why not invited them over for a coffee? Getting active is another way to get connected. Spend time in the park chatting to the neighbors or join a walking or biking club. If you want a challenge, consider taking up that hobby you never had time for, or take a course to learn something new and meet new people. For those with hearing loss, staying connected can seem impossible. The first step is to take control of your hearing health and take a hearing test. At My Hearing Centers our group of trained hearing specialists will test your hearing in quiet and in noise and test your range of hearing. We’ll also talk about your health history and lifestyle to get a clear picture of your hearing needs. While hearing loss might be a normal part of aging, facing social isolation is not. After you’ve had a hearing test, we’ll help you choose the perfect hearing devices that will keep you connected with your friends and loved ones, and active in your community. Hearing devices of today are sophisticated mini computers that come with a wide range of customizable features and settings to help you hear in every listening environment and can be tailored to suit your exact hearing strengths and weaknesses. With directionality microphones, speech enhancement, noise reduction, and binaural hearing, these devices do all the work for you. Having trouble talking on the phone or hearing the TV? Many of our top hearing aid brands come with streaming capabilities so you can connect to your other devices wirelessly for the best listening experience. Treating your hearing loss with a hearing aid will give you back your ability to connect, without you having to do a thing. Just pop them in in the morning and enjoy a day of connecting with the people in your life who mean the most. Call us today to book an appointment.